For other uses, see Muskrat (disambiguation). The muskrat's name probably comes from a word of Algonquian (possibly Powhatan) origin, muscascus (literally "it is red", so called for its colorings), or from the Abenaki native word mòskwas, as seen in the archaic English name for the animal, musquash. Because of the association with the "musky" odor, which the muskrat uses to mark its territory, and its flattened tail, the name became altered to musk-beaver; later it became "muskrat" due to its resemblance to rats. 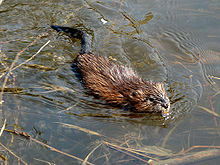 An adult muskrat is about 40–70 cm (16–28 in) long, half of that is the tail, and weighs from 0.6–2 kg (1.3–4.4 lb). That is about four times the weight of the brown rat (Rattus norvegicus), though an adult muskrat is only slightly longer, and are almost certainly the largest and heaviest members of the diverse family Cricetidae, which includes all voles, lemmings, and most mice native to the Americas. Muskrats are much smaller than beavers (Castor canadensis), with which they often share their habitat. Muskrats are covered with short, thick fur, which is medium to dark brown or black in color, with the belly a bit lighter (countershaded); as the age increases, it turns a partly gray in color. The fur has two layers, which help protect them from the cold water. They have long tails covered with scales rather than hair, and to aid them in swimming, are slightly flattened vertically, which is a shape that is unique to them. When they walk on land, their tails drag on the ground, which makes their tracks easy to recognize. Muskrats spend most of their time in the water and are well suited for their semiaquatic life. They can swim under water for 12 to 17 minutes. Their bodies, like those of seals and whales, are less sensitive to the buildup of carbon dioxide than those of most other mammals. They can close off their ears to keep the water out. Their hind feet are semiwebbed, although in swimming, their tails are their main means of propulsion. Muskrats normally live in groups consisting of a male and female pair and their young. During the spring, they often fight with other muskrats over territory and potential mates. Many are injured or killed in these fights. Muskrat families build nests to protect themselves and their young from cold and predators. In streams, ponds, or lakes, muskrats burrow into the bank with an underwater entrance. These entrances are 6–8 in (15–20 cm) wide. In marshes, push-ups are constructed from vegetation and mud. These push-ups are up to 3 ft (91 cm) in height. In snowy areas, they keep the openings to their push-ups closed by plugging them with vegetation, which they replace every day. Some muskrat push-ups are swept away in spring floods and have to be replaced each year. 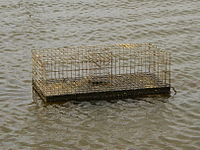 Muskrats also build feeding platforms in wetlands. They help maintain open areas in marshes, which helps to provide habitat for aquatic birds. Muskrats provide an important food resource for many other animals, including mink, foxes, coyotes, wolves, lynx, bobcats, bears, eagles, snakes, alligators, and large owls and hawks. Otters, snapping turtles, and large fish such as pike prey on baby muskrats. Caribou and elk sometimes feed on the vegetation which makes up muskrat push-ups during the winter when other food is scarce for them. In their introduced range in the former Soviet Union, the muskrat's greatest predator is the golden jackal. They can be completely eradicated in shallow water bodies, and during the winter of 1948–49 in the Amu Darya (river in central Asia), muskrats constituted 12.3% of jackal faeces contents, and 71% of muskrat houses were destroyed by jackals, 16% of which froze and became unsuitable for muskrat occupation. Jackals also harm the muskrat industry by eating muskrats caught in traps or taking skins left out to dry. Muskrats have sometimes been a food resource for North Americans. In the southeastern portion of Michigan, a longstanding dispensation allows Catholics to consume muskrat as their Friday penance, on Ash Wednesday, and on Lenten Fridays (when the eating of flesh, except for fish, is prohibited); this tradition dates back to at least the early 19th century. Royal Canadian Mounted Police winter hats are made from muskrat fur. ^ a b Keddy, P.A. (2010). Wetland Ecology: Principles and Conservation. (2nd edition) Cambridge, UK:Cambridge University Press. ^ "Muskrat". Online Etymology Dictionary. ^ Hearne, Samuel. (1745–1792). A Journey to the Northern Ocean: The Adventures of Samuel Hearne. Surrey, BC: TouchWood Editions. ^ "Muskrat". Merriam-Webster Dictionary. Merriam-Webster. October 2, 2011. Retrieved October 2, 2011. ^ Bomare, Jacques-Christophe Valmont de (1791). Dictionnaire raisonné universel de l'histoire naturelle (in French). p. 205. ^ Wildlife Directory: Muskrat – Living with Wildlife – University of Illinois Extension. M.extension.illinois.edu. Retrieved on 2012-12-20. ^ Muskrats Archived 2012-02-04 at the Wayback Machine. Library.csi.cuny.edu. Retrieved on 2012-12-20. ^ Keddy, P. A., Gough, L., Nyman, J. A., McFalls, T., Carter, J., and Siegnist, J. (2009). Alligator hunters, pelt traders, and runaway consumption of Gulf Coast marshes: a trophic cascade perspective on coastal wetland losses. In Human Impacts on Salt Marshes: A Global Perspective. eds. B. R. Silliman, E. D. Grosholz, and M. D. Bertness, pp. 115–133. Berkeley, CA: University of California Press. ^ Chai J. Y., Darwin Murrell K. & Lymbery A. J. (2005). "Fish-borne parasitic zoonoses: Status and issues". International Journal for Parasitology 35(11-12): 1233-1254. doi:10.1016/j.ijpara.2005.07.013. ^ Attenborough, David. (2002). The Life of Mammals, Episode 4. BBC Video. ^ "The Muskrat". McMaster University. Archived from the original on 22 April 2007. ^ Smith, Murray (May 1982). "Science for the Native Orientated Classroom". Journal of American Indian Education. Arizona State University. 21 (1). Archived from the original on 2010-06-16. Retrieved 2010-01-08. ^ Musgrave, P. (2007). How the Muskrat Created the World, Muskrat.com Accessed 11 November 2007. ^ Apicius (7 May 2012). Cookery and Dining in Imperial Rome. Courier Corporation. pp. 205–. ISBN 978-0-486-15649-1. ^ Ciardi, J. (1983). On Words. NPR. ^ "RCMP Muskrat Hat". williamscully.ca. William Scully Ltd. 9 February 2005. Retrieved 9 June 2015. Wikimedia Commons has media related to Ondatra zibethicus. The New Student's Reference Work: "Muskrat"